Rubrobacter radiotolerans strain RSPS-4 is a slightly thermophilic member of the phylum “Actinobacteria” isolated from a hot spring in São Pedro do Sul, Portugal. This aerobic and halotolerant bacterium is also extremely resistant to gamma and UV radiation, which are the main reasons for the interest in sequencing its genome. Here, we present the complete genome sequence of strain RSPS-4 as well as its assembly and annotation. We also compare the gene sequence of this organism with that of the type strain of the species R. radiotolerans isolated from a hot spring in Japan. The genome of strain RSPS-4 comprises one circular chromosome of 2,875,491 bp with a G+C content of 66.91%, and 3 circular plasmids of 190,889 bp, 149,806 bp and 51,047 bp, harboring 3,214 predicted protein coding genes, 46 tRNA genes and a single rRNA operon. Rubrobacter radiotolerans strain RSPS-4 is a slightly thermophilic actinobaterium isolated from a hot spring in central Portugal . Species of the genus Rubrobacter are extremely resistant to ionizing radiation [1–4]. The type strain of Rubrobacter radiotolerans P-1T (DSM 5868T, JCM 2153T) from Japan and strain RSPS-4 are two of the most resistant organisms to ionizing radiation, more so than the archetypal Deinococcus rediodurans strain R1 (DSM 20539T, JCM 16871T) . Both R. radiotolerans strains have a sigmoid shaped survival curve on a dose-response irradiation curve up to 25 kGy and a shoulder dose of 5.7 kGy, with a 37% survival of 7.6 and 9.0 for the type strain of R. radiotolerans and strain RSPS-4 . Microbial resistance to ionizing radiation is rather intriguing since gamma radiation is restricted to locations contaminated with nuclear waste, while natural environments with high doses of gamma radiation are not known in the biosphere. One hypothesis is that radiation resistance is related to desiccation resistance in some organisms that do not produce spores . While the species of Deinococcus are the preeminent extremely radiation-resistant organisms , other radiation-resistant microbes are isolated from very diverse environments and are classified in taxa that belong to different phyla and domains, suggesting that this characteristic evolved independently and in response to other environmental challenges, possibly desiccation or reactive oxidative stress (ROS). Radiation-resistant organisms have been described from archaea such as Thermococcus gammatolerans  to bacteria, such as Deinococcus  and Truepera , both of which belong to the phylum Deinococcus-Thermus, Actinobacteria of the genera Rubrobacter  and Kineococcus , Proteobacteria of the genera Methylobacterium  and Acinetobacter, Sphingobacteria of the genus Hymenobacter  and cyanobacteria of the genus Chroococcidiopsis . Deinococcus radiodurans has been the most studied bacterium for radiation resistance mechanisms [14–20], however, no single key factor has been identified to explain its resistance and it is now hypothesized that the ability to recover from high doses of irradiation results from a combination of several mechanisms. DNA repair systems were the first studied resistance mechanisms, but D. radiodurans contains a set of enzymatic repair systems similar to radiation-sensitive bacteria such as Shewanella oneidensis and Pseudomonas putida [15,21] and such systems are thus insufficient per se to justify the almost error-free reassembly of the irradiated D. radiodurans genome . Recent findings shifted the focus from DNA repair to antioxidant protein protection as a main resistance mechanism [15,23]. Several studies showed that irradiated cells maintained enzymes protected from oxidative stress and thus available for an efficient repair of DNA lesions [24–27]. Here, we describe the complete sequencing and annotation of the genome of R. radiotolerans RSPS-4, identify genes involved in the main repair pathways for DNA, the synthesis of compatible solutes that could be involved in the protection of enzymes and in the response to oxidative stress, and analyze the differences between strain RSPS-4 and the type strain P-1T (DSM 5868T, JCM 2153T). This genome will help understand the genetic basis for radiation resistance mechanisms and provide data for broader comparative studies with other radiation resistance bacteria. Rubrobacter belongs to the phylum “Actinobacteria” formerly known as the high G+C Gram-positive bacteria. The genus comprises four species, three of which, were isolated from thermal environments, namely Rubrobacter xylanophilus recovered from the thermally polluted runoff from a carpet factory in the United Kingdom ; Rubrobacter radiotolerans  isolated from a hot spring in Japan after gamma-irradiation of the water sample  and Rubrobacter taiwanensis isolated from non-irradiated samples from Lu-Shan hot spring in the central region of Taiwan . The mesophilic species Rubrobacter bracarensis, was isolated from a green biofilm covering the biodeteriorated interior walls of a Church at Vilar de Frades, in Portugal , but is not known to be gamma-, UV- or desiccation-resistant. Phylogenetic analysis of 16S rRNA gene sequences indicates that the species of the genus Rubrobacter belong to the monogeneric family Rubrobacteraceae (Figure 1), which along with the genera of the families Solirubrobacteriaceae, Thermoleophilaceae, Conexibacteraceae, Patulibacteraceae and Gaiellaceae form deep-branching lineages of the subclass Rubrobacteridae of the phylum “Actinobacteria” . The species R. radiotolerans is most closely related to R. bracarensis . 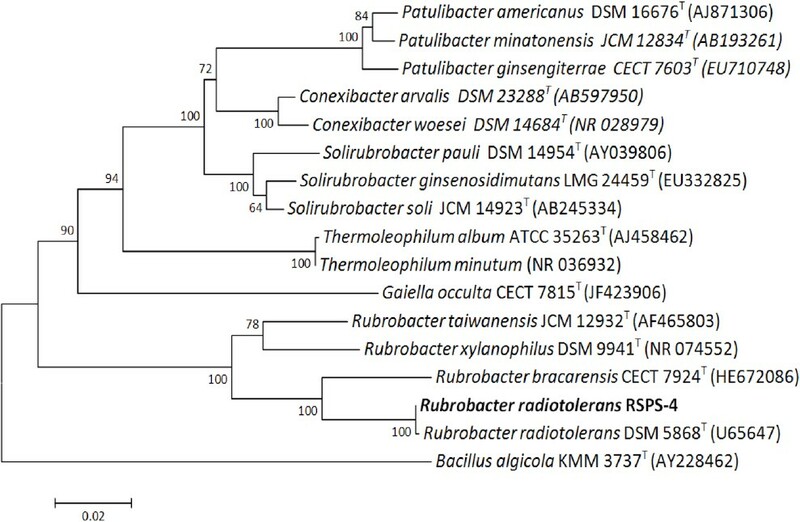 Phylogenetic tree showing the position of Rubrobacter radiotolerans strain RSPS-4 with other organisms within the subclass Rubrobacteridae. The tree was inferred from 1,301 aligned characters of the 16S rRNA sequences of different species using the Neighbor-Joining method ; bootstrap values are based on 1,000 replicates . The evolutionary distances were calculated using the Jukes-Cantor method . Analysis was carried out with MEGA6 . Bacillus algicola KMM 3737T (AY228462) was used as an outgroup. The Rubrobacter radiotolerans strain RSPS-4 was isolated from a hot spring runoff at São Pedro do Sul, in central Portugal, after irradiation of the water sample with a cobalt-60 source at a dose of 8.06 kGy and a rate of 1.5kGyh−1 . The hot spring runoff had a temperature of 50°C and a pH of 8.9. The strain grew optimally at 45°C in medium containing no added NaCl but was able to grow in medium containing 6% NaCl (w/v), degraded hide powder azure, gelatine, hippurate, arbutin and esculin, was cytochrome oxidase, catalase and β-galactosidase positive and produced nitrite from nitrate. The fatty acid composition of RSPS-4 was dominated by the unique 12-methyl-16:0 (70% of the total) with lower amounts of 4-methyl-18:0 (15.7%-17.8% of the total fatty acids). The 16S rRNA gene sequence of strain RSPS-4 is similar to the sequence of the type strain of R. radiotolerans DSM 5868T , only differing in 2 positions. Classification and general features of Rubrobacter radiotolerans RSPS-4 are shown in Table 1. The strain was deposited at the Spanish Type Culture Collection (CETC) with the code CECT 8386. Classification and general features of Rubrobacter radiotolerans RSPS-4 according to the MIGS recommendations . R. radiotolerans strain RSPS-4 was selected for sequencing based on its extremely high resistance to ionizing radiation. The complete genome sequence is available from GenBank. Sequencing was performed at Roche Diagnostics GmbH, Penzberg, finishing and annotation were performed by Biocant. A summary of the project is shown in Table 2. 454 Roche Newbler Assembler, Phrap and Consed. Rubrobacter radiotolerans strain RSPS-4 was grown on Thermus medium at 45°C as described elsewhere . DNA isolation was performed from a 1g pellet of a 24h, exponential growth phase culture using the Wizard Genomic DNA Purification Kit (Promega, Madison, USA) following the standard protocol, without modifications, for genomic DNA isolation of Gram positive bacteria, as recommended by the manufacturer. The genome of strain RSPS-4 was sequenced in the GS20 sequencing platform (Roche-454 Life Sciences) at Roche Diagnostics GmbH, Penzberg, Germany. A total of 3 PicoTiterPlates generated 889,098 pyrosequencing reads with an average length of 106 bp. These were assembled into 70 contigs, with an N50 of 120,613, using the Newbler assembler (Roche). The Phred/Phrap/Consed software package [45,46] was used for sequence assembly and quality assessment in the subsequent finishing procedures. The gaps were closed by an Optimized Multiplex PCR approach , where 156 Sanger sequences were produced and added to the 454 reads to produce a hybrid assembly with Phrap. Together, 454 and Sanger sequences provided a 23× coverage of the genome. Structural and functional annotation has been performed using PGP (Prokaryotic Genome Prediction) an in-house developed pipeline. PGP used tRNAscan-SE , RNAMMer  and PILERCR  to predict non-coding genes and miscellaneous features. These features were then masked and the CDS predicted with Prodigal . Furthermore, PGP automatically corrected the start position of each CDS based on the Geneprimp  algorithm. Functional annotation was carried out under PGP in InterProScan  against PFAM , TIGRFAM , Hamap , PIRSF , PRINTS , SMART , SUPERFAMILY , ProSite  databases and RPS-BLAST against COG database  The product name of each CDS was assigned using TIGRFAM, COG and PFAM annotation . Those CDS that were not annotated with these databases were assigned as hypothetical proteins. The automatic annotation was followed by a round of manual curation to eliminate obvious overlaps by visualization of the obtained functional annotation with Artemis . Possible mis-assemblies and mis-annotations were corrected by comparison to the genome of Rubrobacter radiotolerans DSM 5868T, assembly of 2011, produced by the US Department of Energy Joint Genome Institute. The genome sequence was completed in 2013 and presented for public access in 2014. The genome sequence for Rubrobacter radiotolerans strain RSPS-4 was deposited at GenBank under the accession number CP007514 (Chromosome), CP007515 (Plasmid 1), CP007516 (Plasmid 2) and CP007516 (Plasmid 3). 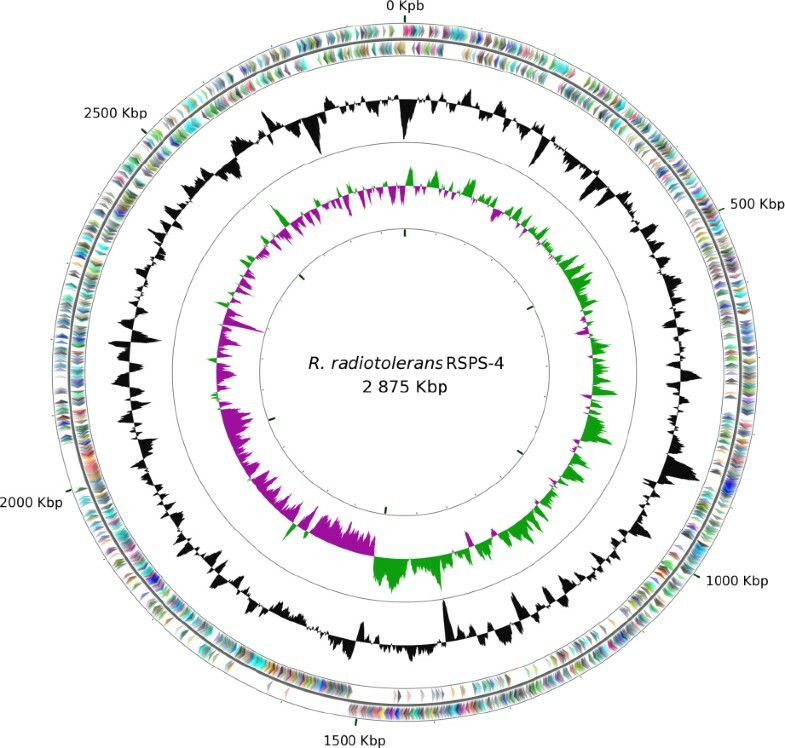 The Rubrobacter radiotolerans strain RSPS-4 genome consists of one circular chromosome of 2,875,491 bp (G+C content 66.9%) (Figure 2) and three plasmids, with 190,889 bp (G+C content 65.66%), 149,806 bp (G+C content 66.48%) and 51,047 bp (G+C content 63.17%) (Figure 3). Of the 3,214 protein-coding genes predicted, 2,772 are located in the chromosome, 191 in plasmid 1, 137 in plasmid 2, and 59 in plasmid 3. The majority of the protein-coding genes, (2,646, 82%) were assigned a putative function while the remainder were annotated as hypothetical proteins. 46 tRNAs encoding all the 20 amino acids and 1 rRNA operon were annotated. The replication origin was set to the first nucleotide of the dnaA gene. Genome properties are summarized in Table 3, Table S1 and Figure 2 and the distribution of genes into COGs functional categories is presented in Table 4. Circular representation of the chromosome of R. radiotolerans RSPS-4. From outside in, the outer two circles show genes on forward strand and reverse strand, colored by COG categories, the third circle shows the G+C% content plot (colored in black), and the inner circle the GC skew (green and purple). Graphics were created on the CGViewer Server . Circular representation of the plasmids of R. radiotolerans RSPS-4. From outside in, the outer two circles show genes on forward strand and reverse strand, colored by COG categories, the third circle shows the G+C% content plot (colored in black), and the inner circle the GC skew (green and purple). Graphics were created on the CGViewer Server . The genome sequence of strain RSPS-4 was analyzed for genes involved in recovery from ionizing radiation: DNA repair, oxidative stress response and compatible solute production. The key enzymes for the main DNA repair mechanisms were present in the genome, except for the non-homologous end joining, suggesting a shared set of DNA repair enzymes with other radiation-resistant bacteria. The pathways for oxidative stress response were also investigated but not all key enzymes were identified, suggesting that further studies are required in this bacterium to fully understand oxidative stress response and its role in radiation resistance. RSPS-4 possessed the four described pathways for trehalose production. Finally, the RSPS-4 genome sequence was compared to that of R. radiotolerans DSM 5868T type strain. The two strains practically shared the same nucleotide sequence, the same gene order, orientation and synteny, however strain DSM 5868T had extra segments, probably corresponding to putative prophages. Gamma radiation induces the production of highly reactive oxygen radicals (ROS) in cells by ionizing water from several macromolecules. In DNA, ROS induce base modifications, DNA single-strand and double-strand breaks . The latter are considered the most dangerous for survival and most difficult to repair. The R. radiotolerans RSPS-4 genome was analyzed for DNA repair pathways by searching genes involved in homologous recombination, single strand annealing (SSA), extended synthesis-dependent strand annealing or non-homologous end joining [67,68]. RSPS-4 strain encodes a set of essential genes for homologous recombination. All genes for the RecFOR pathway were detected, recF (RradSPS_0004), recR (RradSPS_0466), recO (RradSPS_1511), and recJ (RradSPS_0780). RecA, the protein responsible for strand invasion and exchange, was encoded as a single copy (RradSPS_1428). Genes encoding the branch migration and resolution of Holliday junction proteins RuvA (RradSPS_1317), RuvB (RradSPS_1318), RuvC (RradSPS_1316), and RecG (RradSPS_1377) were detected, as were the homologs of the genes encoding the SbcD (mre11) (RradSPS_2355), and SbcC (Rad50) (RradSPS_2356) proteins. The gene coding for the RecX (RradSPS_1429) protein, which acts as a negative regulator of RecA, was also present. The genes encoding proteins involved in extended synthesis dependent strand annealing were also present in the strain RSPS-4 genome: PolA (RradSPS_0202), which participates in the initial DNA synthesis-step, RecA, that ensures the maturation of the linear intermediates into full-size circular chromosomes and RadA (RradSPS_1965), a protein involved in the stabilization or processing of branched DNA molecules  and in the priming step in DNA strand elongation . Homologs of the Ku-like complex proteins and DNA ligase IV complex, the most relevant proteins involved in non-homologous end-joining pathway were not found in RSPS-4 strain, suggesting that this repair pathway may not be functional. Mismatch repair (MMR) is probably functional in RSPS-4 with gene copies of mutL (RradSPS_0036 and _0159), and mutS (RradSPS_0158). The absence of the gene encoding the MutH endonuclease, which participates in the recognition of GATC methylated sequences discriminating the DNA strand to be repaired, should not compromise the efficiency of this pathway, as this protein is also absent from several bacterial genomes . No dcm or dam site specific methylase genes were detected, suggesting that strain RSPS-4 uses different proteins for strand recognition and incision to complete MMR. Homologs of xseA and xseB, encoding the subunits of a MMR exonuclease, were not detected. A particular feature of the RSPS-4 DNA repair pathways was the absence of the LexA autoprotease, the repressor that controls the expression of the SOS regulon in E. coli. The gene could not be identified in the RSPS-4 genome, based on a nucleotide sequence search using the two lexA genes described for the type strain DSM 5868T. Furthermore, the absence of this gene was validated by PCR amplification, using the genes of R. radiotolerans strain DSM 5868T as template to design specific lexA primers. The absence of this gene has been observed in bacteria from many genera, such as Mycoplasma, Chlamydia, Borrelia, Helicobacter, Coxiella, and the Cyanobacteria [71–73], and suggests alternative mechanisms to repair DNA damage in bacteria could be employed. In Lactococcus lactis, a LexA-independent SOS response is led by the HdiR protein . Moreover, other mechanisms may act alone or synergistically with the SOS response in DNA damage repair. In the radio-resistant D. radiodurans, the two LexA homologs undergo RecA-dependent cleavage after DNA damage, however, no regulon under the control of LexA1 or LexA2 proteins has been identified to date . In this organism, recA induction following gamma irradiation is not controlled by LexA1 or LexA2 but depends on a Deinococcus specific regulatory protein IrrE, also designated PprI, a positive effector that enhances the expression of some DNA repair genes following exposure to radiation . In deinococci, additional genes have been identified for DNA repair of irradiation damage, however these were absent from strain RSPS-4. No homologs of irrE or pprA were found , suggesting that Rubrobacter uses other pathways for the same mechanism. The ddrA, ddrB, ddrC and ddrD genes  are also absent. Their absence from the Kineococcus radiotolerans genome  suggests their specificity to the deinococci. Reactive oxygen species (ROS) including hydrogen peroxide, superoxide and hydroxyl radicals are toxic to cells due to their ability to damage DNA and specially proteins containing iron-sulfur clusters or sculpture atoms. In order to prevent the damage induced by ROS, cells have several mechanisms of response to oxidative stress. Strain RSPS-4 has a single gene for a manganese containing catalase (RradSPS_2184), whilst katA, katE and katG were not detected [15,78]. Superoxide dismutase was also encoded as a single gene identified as sodA (RradSPS_0327), and was also dependent on manganese . Peroxiredoxins, which reduce H2O2 to water, were encoded by six copies of alkyl hydroperoxide reductase subunit C/Thiol specific antioxidant (AhpC/TSA) (RradSPS_0148, _0515,_ 988, _1124, _2530, _2650) while peroxidases such as BsaA were not detected. A single gene for thioredoxin reductase trxR (RradSPS_0074)  was detected in the genome, as well as a gene for the trxA (RradSPS_0519) and two for grxA redoxins (RradSPS_1230 and _3087), involved in redox balance . A single gene for thiosulfate transferase (RradSPS_0885)  was also found in the genome. Although regulatory genes of the oxyR family were not detected, lysR (RradSPS_1021, _1060, _1715, _1856 and _2024), which activates the transcription of genes involved in peroxide metabolism and protection in D. radiodurans (katG, ahpC, ahpF, and dps) were detected . Manganese has been proposed to be an important mechanism for oxidative stress response. This ion is suggested to protect cytosolic proteins from ROS by replacing Fe2+ and other divalent cations such as Mg2+ or Cu2+ as cofactors, and by forming ROS-scavenging complexes with various metabolites that preserve enzyme quaternary structures . In strain RSPS-4, the catalase and the superoxide dismutase genes are predicted to encode manganese-containing enzymes and two ABC-type Mn2+/Zn2+ transport systems were present in the genome sequence (RradSPS_1136, _1137 and _1138; RradSPS_2222, _2223 and _2224) . Two compatible solutes, namely trehalose and mannosylglycerate, accumulate to high levels in R. xylanophilus and R. radiotolerans RSPS-4 [81,82], but the accumulation of these osmolytes is not dependent on the salt concentration of the growth medium as it is in so many halotorerant and halophilic organisms. Instead, the accumulation of these compatible solutes is constitutive indicating that the accumulation of these compatible solutes is most likely in response to any of several stress conditions that may affect the survival of the cells . The genome sequence of R. radiotolerans RSPS-4 and R. radiotolerans DSM 5868T possess many of the key genes for the synthesis of trehalose and mannosylglycerate. Strain RSPS-4 and DSM 5868T possess identical mannosylphospglycerate synthases that are homologs of R. xylanophilus (mpgS, EU847586.1) (RradSPS_0500; Rrad_0501). The synthesis of trehalose could proceed via four pathways namely through the TpS/TpP (RradSPS_0264 and _0265; Rrad_0265 and _0266), the TreS (RradSPS_0192; Rrad_0194), the TreT (RradSPS_0753; Rrad_0753) or the TreY/TreZ pathways (RradSPS_0196 and _0195; Rrad_0198 and _0197), homologs of which are found in both R. radiotolerans strains. The TpS/TpP and the TreT pathways were examined in R. xylanophilus and both were involved in the synthesis of trehalose . Trehalose is considered to be a solute involved in the protection of many biological structures under different stress conditions and is considered to be especially important under extreme desiccation . The genome sequence of R. radiotolerans RSPS-4 was compared to the genome of Rubrobacter radiotolerans DSM 5868T. The genome structure was similar in the two strains, a major chromosome and 3 plasmids. However, the genome of strain DSM 5868T, with 3,398,074 bp and 3266 genes, is larger by 130,841 bp than the genome of the RSPS-4 genome. Alignment of the two genome nucleotide sequences with the tool MISHIMA  revealed the two genome sequences practically shared the same nucleotide sequence, the same order, orientation and synteny. The main differences resided in chromosome 1 and plasmid 1. In chromosome 1, strain DSM 5868T had an extra 87,086 bp segment of 70 genes (Table S2). This segment encodes a putative prophage, flanked by an integrase in the first position (Rrad_2453), and transposases at the other end (Rrad_2527 and _2528). Plasmid 1 of DSM 5868T contained a segment of 55 genes that was only observed in this strain (Table S3). This 56,691 bp segment was flanked at one end by a resolvase (Rrad_2844) but no enzyme related to mobile elements was observed at the other end. Strain RSPS-4 also had a genome segment that was absent from the DSM 5868T strain. This was a segment of 11 genes, corresponding to 11,639 bp, in plasmid 1 (Table S4). This segment harbors two transposases (RradSPS_2871 and _2872) and a recombinase (RradSPS_2873), although they are positioned in the middle of the segment and may be the remnant of the insertion of mobile elements. Apart from the proteins related to mobile elements, the two additional segments present in the type strain have several transcriptional regulators (Table S2 and S3). LexA was present in two copies, one in the chromosomal segment (Rrad_2461) and the other in plasmid 1 (Rrad_3065). The location of this gene within a mobile region may explain its absence from the RSPS-4 strain. Other transcriptional regulators were identified in these genome segments; the transcriptional regulator of the XRE family (Rrad_2455 and _3061), which acts as a repressor-like protein of several phages , ArsR (Rrad_2469), which participates in the stress response to heavy metals  and LuxR (Rrad_2505 and _2856) and TetR (Rrad_2866 and _2871), which are involved in diverse pathways such as those encoding virulence factors and antibiotics biosynthesis , the control of multidrug efflux pumps, and the response to osmotic stress or toxic chemicals . The extra segments present in DSM 5868T genome were populated by hypothetical or conserved hypothetical genes, 32 in the chromosome 1, and 29 in plasmid 1 (Table S2 and S3). The segments additionally encoded transporters involved in heavy metal homeostasis (such as heavy metal translocating P-type ATPase, (Rrad_2468)), proteins involved in lipid biosynthesis (such as 4′-phosphopantetheinyl transferase), proteins involved in the type II/III secretion system (Rrad_2515, _2516 and _2853) and several enzymes involved in the respiratory chain (Rrad_2470-2477) (Table S2). Most genes in the extra segments of type strain were actually also encoded in other regions of the genome, suggesting that the duplication of certain genes may provide the DSM 5868T strain with increased ability to respond to stress conditions. The complete genome sequence and annotation of Rubrobacter radiotolerans strain RSPS-4 was hereby presented. The genome comprises 1 chromosome and 3 circular plasmids which together represent an organism of approximately 3.2 Mb. The genome sequence encodes for several key genes involved in the mechanisms of DNA repair, in response to oxidative stress and in the production of compatible solutes. However, some of the described pathways are not complete and await further studies to fully understand the mechanisms behind the RSPS-4 extreme resistance to radiation.